Boromir has departed, as only Sean Bean can. 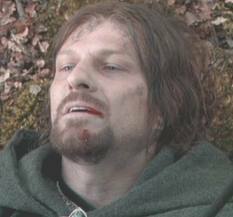 With his last breath, Boromir recounts fighting off orcs from Merry and Pippin, but they were carried away when he fell. They are probably still alive, though. He also asks Aragorn to defend Minas Tirith in his stead. Aragorn grants his request, holding him and asking about whether he saw Frodo and Sam. Boromir is too dead to answer. Legolas and Gimli arrive, having been hunting orcs until they heard Boromir’s horn. They stand in silence as Aragorn mourns. The Ranger relays Boromir’s last words, and Legolas moves to attend to his body. RIP Boromir. May House Stark avenge you. Er…you were such a jerk to MI6 and Bond! 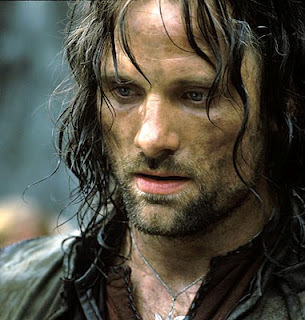 Um…you weren’t as good as Aragorn, but I guess you were alright. And that’s the first…er, second major death! Unfortunately, Aragorn puts it all on himself. He believes that everything going wrong in this day is his fault, and that he was unworthy of leading the Fellowship Company. How could Gandalf ever have trusted him? Hey…is that another opportunity for character growth I see? Even a scoundrel such as this can become king. Character growth is super great, and now that we’re seeing the story from Aragorn’s perspective, it’s his turn. Right now, he’s very unsure of himself. That’s no way to be a king, but he still has a long way to go. He’s only going to be leading Legolas and Gimli now, which is much more manageable. Let’s pay close attention to how he takes control of the group from here on out. That whole “Frodo and Sam maturing” thing? That can wait.